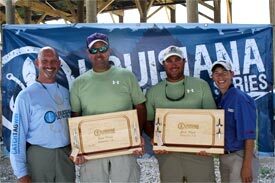 The second annual Louisiana Saltwater Series made its third stop on the tournament trail at Sweetwater Marina in Delacroix, La., with 44 boats entered and over $7,000 awarded in cash prizes. The series was developed by the Louisiana Department of Wildlife and Fisheries (LDWF) in conjunction with the Louisiana Wildlife and Fisheries Foundation to promote conservation of Louisiana's saltwater sport fish resources and targets one of Louisiana's most valuable sport fish, redfish. Taking home first place overall were Jason LeBlanc and Kory Matherne, of Marrero, with a two fish total weight of 16.57 pounds. A total of 109 redfish were tagged and released during Saturday's event. The results of the tagging will aid conservation efforts for redfish in the future, helping to ensure healthy populations and a successful recreational fishing industry. Visit www.lasaltwaterseries.com for more information, including event photographs and a complete listing of results. Each series includes two-man teams with a $200 entry fee for each event. For teams consisting of three members, only two of the members may be 16 or older. The tournament is a 100 percent payout series. Mark your calendars for our next tournament on July 23 at The Dock and Dockside Bait and Tackle in Slidell. The Disney Radio Road Crew will be on-site to entertain kids of all ages with interactive, hands-on, music and contest-filled events, so be sure to bring the entire family.